The Easter Holidays have arrived and if you’re looking for ways to keep your family entertained, this guide is just what you need…It’s time to dig out the PVA glue, round-up the little yellow chicks and start getting creative. 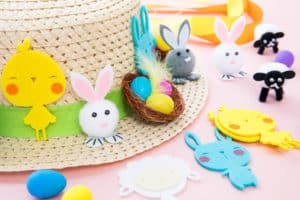 The stakes are always high when it comes to decorating an Easter bonnet and Poundland is making it easier than ever, with its wide range of craft accessories and decorations from £1 each. Discover everything from the bonnet and mini chicks, to polystyrene eggs and pom poms in store in Poplar Way. Quick Tip: Are you thinking of making your bonnet into a bunny? Find the perfect fluffy tail (cotton wool balls) at Boots in Mell Square. For your art cupboard essentials, WHSmith in Mell Square is the place to go. With reams of coloured card, crepe paper and a wealth of poster paints, it’s the ideal place to find the basics for any craft project. Have you seen WHSmith’s Easter craft inspiration yet? From getting arty making handmade Easter cards, to creating small paper-based crafts, including suncatcher eggs and crazy paper chicks, there’s something for children of all ages. Discover more craft ideas and instructions here. Or, if getting creative in the kitchen is more your style, Sainsbury’s in Poplar Way is the ideal place to pick up your ingredients and find some recipe inspiration. 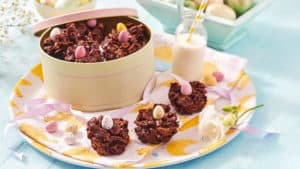 Whether you’re opting for the classic Easter chocolate nests, made from chocolate-covered cornflakes and mini eggs, or fancy giving iced shortbread biscuits a whirl, Sainsbury’s has it all. Find more Easter recipes here. So, what are you waiting for? Grab your aprons and enjoy fun with the whole family with a helping hand from Mell Square. Keep-up-to-date with the latest news and offers by searching Mell Square on Facebook, Instagram and Twitter.